Isn’t that a great cover? The Paragon Hotel is one of those books that makes you feel as though are standing right next to the characters as they live out their story. You can feel the rattle of the train, hear the music of the nightclubs, and feel the fear as more characters are victimized. Set in 1921, “Nobody” Alice James is on her way to the west coast to escape her ties to the New York Mafia. Suffering from a bullet wound, Alice is helped to safety by Max, a porter on the train with a weakness for damsels in distress. But that feeling of safety is short lived when Alice realizes where she is-The Paragon Hotel, the only all black hotel in Portland, Oregon. There Alice meets Dr. Pendleton, who is not pleased about treating her, the owner of the hotel and decorated war hero. The hotel is managed by Mavereen, a strong and stern woman who protects her friends and family fiercely. Last, but definitely not least, is Miss Blossom Fontaine, a cabaret dancer who is hiding some seriously big secrets. Together, the group has to survive the KKK, a missing child, a lynching, and bouts with the police. And secrets-so many, many secrets. There is so much that goes on in this book that there is no way for me to summarize it more. I absolutely loved this book. It moves very quickly with a lot of jumping back and forth in time and Alice’s backstory is very interesting. Alice’s character has lived so much in her short life but remains incredibly strong and her quick wits save her far more than once. Blossom is hiding a huge secret that does get revealed in the end-and I nearly dropped the book when that was revealed! I really loved how the author handles both Max and Dr. Pendleton’s time in the army. They were amazing soldiers who were incredibly brave and treated as heroes while still in France but all that was ignored when they came back to the States and were subjected to the cruelty of racism and hatred. There are a lot of tough topics, obviously, in this book. Racism, interracial relationships, police brutality, found family, the treatment of women and so many others make an appearance. I was unaware of how openly racist Oregon was a hundred years ago-and obviously, I have some more learning to do. To see how the police had zero cares about a small child disappearing was incredibly frustrating to read. Blossom’s lifestyle is under constant scrutiny. It’s amazing to me, having lived now and not then, how women were treated as though any choice they made outside of marrying a man and having babies was so scandalous. She was a talented singer and dancer and for wanting to pursue a career in that automatically made her promiscuous or worse. I loved the characters, I loved the intensity of it, I loved how the big issues were handled. It’s a great book and I can’t wait to see what others have to say about it. I don’t usually read Author’s Notes but I recommend you do with this one. Lyndsay Faye includes historical facts that were definitely new to me and provide the context for the story. 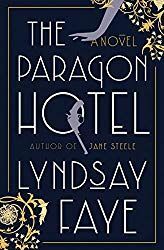 The Paragon Hotel comes out January 8, 2019 by Lyndsay Faye. Thank you to Penguin Random House for an advanced copy, all opinions are my own.